Signed as a free agent on Feb. 15, 2019. 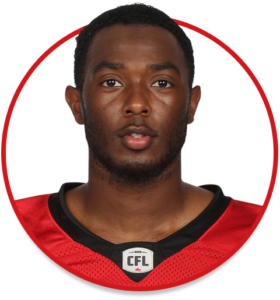 Hayes originally signed with the Stampeders on May 9, 2018, and spent the 2018 season on the club’s practice roster. He signed with the National Football League’s Arizona Cardinals as an undrafted free agent on May 2, 2017. He attended training camp with the Cardinals and was released on Sept. 2, 2017. (Calgary) Hayes spent the entire season on the Stamps’ practice roster. Hayes played 25 games over two seasons (2015-16) at Arizona State. He played as a running back in his junior season and had 16 carries for 57 yards and 11 catches for 44 yards. He made the switch to defensive back for his senior year and had 42 tackles including three tackles for loss, three interceptions and six pass breakups. Hayes also returned 11 kickoffs for 202 yards and 17 punts for 124 yards. Prior to Arizona State, he played at the junior college level for Lackawanna College in Scranton, Pa.
His full real name is De’Chavon Rashard Hayes. He is an alumnus of Varina High School in Richmond, Va.